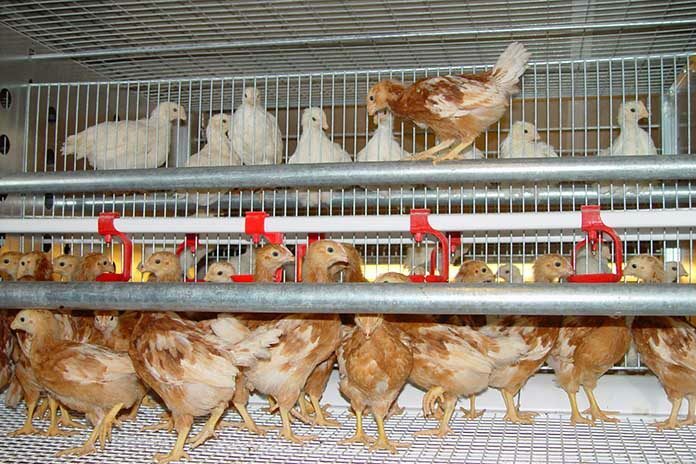 The conditions in cage free systems differ from the traditional cage housing systems and require a different management approach. Alternative production systems can be defined as non-cage systems with nests, adequate perches and a scratching area. Alternative production system could be a barn (deep litter) system, which is a house where birds have access to a litter area, and are able to practice natural behavior like dust bathing and scratching. A barn house also provides nest boxes and can have a slatted area where water and feed are presented. It could also be an aviary house (multi tier), which is like a barn house, but birds are able to move among different levels. Feed is presented on different levels and water is mainly presented in front of the nest box. Birds need to move through the system to eat, drink, rest and produce eggs. It could also be a free range, which is either a barn or an aviary house where the birds have access to an outside range area. This is to produce a uniform flock that attains the correct weight at sexual maturity for a given age. That is to prepare the birds for egg production. We have to achieve the correct body weight and frame development from day-old through sexual maturity. The bird’s ability to resist disease, to respond to vaccines, to reach the correct mature body frame and eventually, to perform to its genetic potential, depends greatly in first 17 weeks of pullets life. The 3 most important parameters in growing are average body weight or growth rate, flock uniformity and livability. The average body weight should be close to the target weight for the breed. We should look for causes if there is big deviation from target weight, like sampling or calculation error, stress, disease, low energy or low protein feed, overcrowding, and other environmental factors. We should start weighing at four weeks and every week up to peak production. The body weight at 5-6 weeks is a very good determinant of pullet quality since studies have shown that the heavier the pullets are at 6 weeks, the more persistent is their rate of lay during egg production. Also the digestive and the immune system are already fully developed by 6 weeks. It’s also very critical that pullets achieve target body weight at 12 weeks to be able to safely stimulate the flock on time at the layer house to support persistent peak production. Flock uniformity is also a very important parameter in growing as birds are managed as a flock and not as individual. Our lighting programs, diet changes and vaccinations are applied to the whole flock so that flock uniformity is so important in obtaining optimum performance and the greatest profitability. The better the uniformity in a laying flock, the higher the peak in egg production, better persistency, livability & uniformity in egg size. Obvious undersized pullets should be culled before 6 weeks of age. At least eighty percentage of the pullets weighed should be within + or -10% of the average weight. If the flocks have poor uniformity, we should search and eliminate the cause/s. Low quantity of feed/poor feed distribution. Flock livability is also a very important parameter in pullet management since a flock can only perform up to its genetic potential when disease influence is minimized or eliminated. The best method of avoiding diseases is to prevent the entry of diseases. So farm biosecurity is very important. A very good vaccination program designed to build-up of immunity or disease resistance against diseases prevalent in the area is also very important component in maintaining excellent flock livability. Good diet and proper husbandry practices are also critical in maintaining excellent flock livability. The goal is to attain a uniform flock with a continuous gain in body weight along the target curve. If body weights are not reaching the standard or target, you should postpone the feed change and/or take other measures to speed growth. And check for other causes like disease, heat stress, overcrowding, and other environmental factors. It is also very important to use the correct grind or particle size of feed. This is to avoid build-up of fine or powdery feed particle. The feeding time of the morning should be arranged so as to get feeders near empty in the middle of the day. Feeding in pairs or stacked feeding is also a very good practice in maintaining flock uniformity. Stacked feeding will allow less aggressive birds more opportunity to eat. 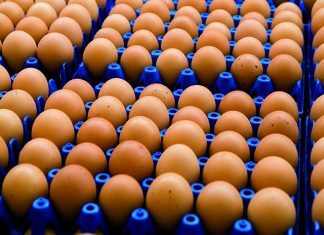 Lighting program main objective are to achieve adequate body weight; to adjust maturity and onset of production for the correct age and stage of development; to achieve the best rate of egg production; and to achieve the required egg size. The general principles of lighting program is that an increasing photoperiod stimulates maturity and a decreasing photoperiod retards maturity and will affect egg production. So the day length control during rearing and laying is important management tool in the achievement of economic performance, both egg numbers and egg weight. Depending on the quality of feeds and level of farm management in the achievement of the pullet target body weight, the farm can either use a quick or 4 weeks step-down to constant light or a longer 7 weeks step-down to constant light if the farm could not achieve their target body weight at 6 weeks. The advantage of using a short step down to constant light is that it will be easier for the birds to respond to the light stimulation for sexual maturity during the onset of lay compared to birds that are on longer step down to constant light. Although the birds in longer step down to constant light will not respond as quickly to the light stimulation as birds in a shorter step down, they will tend to lay slightly bigger eggs at the start of production as they will be heavier when they start their egg production. It is usually recommended to step-down to either 10-12 hours constant light for light-controlled and brownout growing and laying houses. The 10 hours constant light is usually used during winter months when the birds eats well and they easily achieve their target body weight. The 12 hours constant light is used during summer months to give more time to eat when it is hot. Start with high light intensity in the first 2 weeks, then lower the light intensity once the birds already know where the feeds and waterers are located. Our birds can be light stimulated at very low light intensity. The light intensity of the pullet house should be similar to the light intensity you have at the layer house. Light intensity in the layer house should be similar or lower than in the pullet house to keep the birds calmer and minimize pecking. For birds destined to produce eggs on an alternative system (litter, slatted or aviary), it is strongly recommended that the same type of housing system is used in rearing and production. This enables the birds to become familiar with the production house and its equipment after transfer, overcoming this stressful period smoothly. For aviary houses it is strongly recommended that birds are reared on a system which teaches them to jump to water lines, ideally located at a higher level. Providing perches in rearing helps to get a better distribution of birds in the production house. Facilities within the poultry house must be designed for maximum comfort and must allow birds to express their natural behavior. Partitions or pens within the house can be provided to avoid competition and allow birds to have separate areas/pens for feeding and drinking. This will also have a positive effect on bird’s behavior in terms of smothering, cannibalism, feather pecking and mortality. Perches improve welfare by allowing the bird to express its natural behavior. Perches in barn/litter houses should be introduced as early as 4 weeks. Litter is used to cover the floor in a rearing/brooder house. It usually consists of wood shavings or chopped straw. Litter is an important component of the rearing input that must be well managed to prevent unhealthy environment and potential disease conditions. Good quality shavings must be used as litter to avoid the risk of introducing various diseases to the site. The top priority is to keep the litter dry, and well-managed ventilation and good gut health are key points. Litter should be friable and ‘moveable’. The birds help to maintain this condition by scratching and dust bathing. The common problems encountered in cage free production are pecking/cannibalism; smothering/piling; coccidiosis; necrotic enteritis and blackhead or histomoniasis. The possible causes of pecking/cannibalism are mites; worms, ascarid, capillaria infestation; enteritis and diarrhea; inadequate ventilation, leading to higher levels of humidity and smell (ammonia); stress of overcrowding; limited access to drinkers and feeders (insufficient number/ poor distribution); poor beak trimming; sodium deficiency; amino acids deficiency; intensity of light too bright; entry of direct sunlight into the poultry house; and the nest are brightly illuminated– bird’s vents targeted during egg laying. Decrease light intensity. Light intensity in the pullet house should be the same as in the layer house. Add enrichment within the house (pecking blocks, fiber, plastic bottles, plastic toys, cd…). Piling/smothering can be due to panic reaction that is because when birds are frightened, they try to avoid danger. It could also be due to attraction: when they are attracted by something, as they are curious and want to find feed and discover their environment. It could also be due to sleeping behavior: it enables them to reduce the loss of body heat during the night, maintain social link and protection against dangers. Ensure that available perch space is adequate. Adapt the ventilation to obtain a uniform environment in the house and to avoid draughts. Coccidiosis, necrotic enteritis and histomoniasis are again very commonly observed in cage free production. Good vaccination program for coccidiosis, excellent farm biosecurity and sanitation are very important in the control of these diseases.